These D.I.Y. peels are so skin-safe, you can actually eat them. 1 Is Papaya Good for Facial Skin? 3 What Is the Meaning of Exfoliate? Many dermatologists and aestheticians offer glycolic acid peels as part of their services, but you can make safe, natural and affordable alternatives from ingredients you may already have in your pantry or fruit bowl. When added to your regular skin care routine, these peels help speed up your natural skin renewal cycle, and they pack a bevy of benefits along the way. Glycolic acid is a type of alphahydroxy acid, or AHA. When applied as a facial peel, this lightly acidic compound sloughs away dead cells on the surface of the skin. It also penetrates the upper layers of the dermis, which helps unclog pores that have become filled with oil and debris, making the peel a helpful acne-fighting remedy. Compared to the common skin care ingredient salicylic acid, glycolic acid is a more intense anti-aging and anti-acne treatment. As such, glycolic acid is optimal for mature and dry skin types. Glycolic acid's skin-sloughing effect exfoliates the skin, encourages skin renewal and increases the penetration of other skin care products in your regimen. The substance's pore-penetrating quality cuts back on oily skin, blackheads and pimples while softening the appearance of fine lines and brightening the skin. Over time and regular application, glycolic acid peels may reduce minor blemishes, spots and other signs of hyperpigmentation, as these peels target the pigment-heavy upper layers of the skin. The glycolic acid found in professional peels and commercial beauty products is often derived from fruits such as cantaloupe, grapes and pineapple. To harvest AHA's benefits at home, puree a cup of fresh pineapple, ½ cup of papaya and 2 tablespoons of honey in a blender. Apply the mixture to your freshly washed face and leave it on for a few minutes -- you'll feel a slight tightening -- then wash it away with warm water. 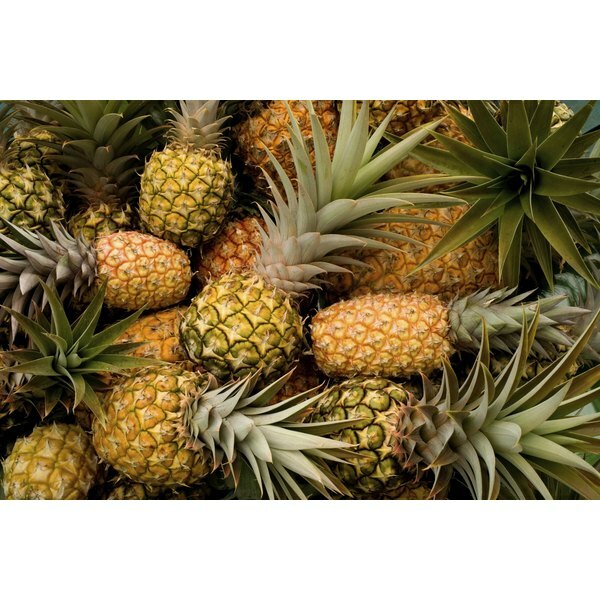 In addition to glycolic acid, pineapple contains the enzyme bromelain, which assists in dead skin cell removal. 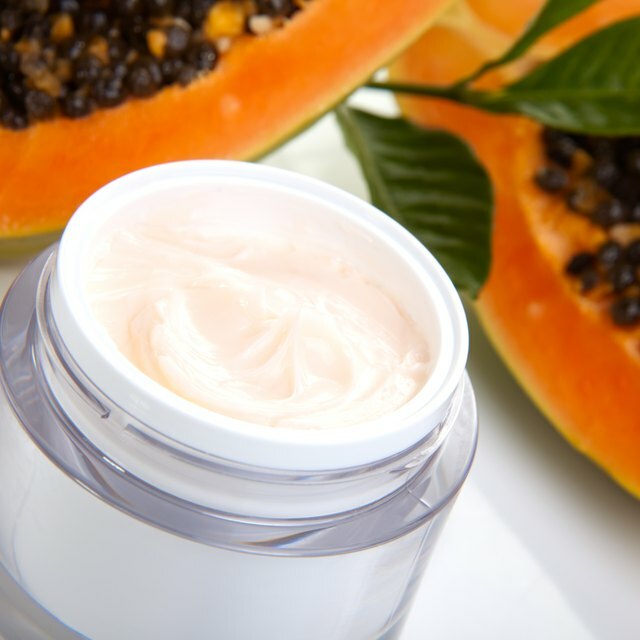 Papaya's papain content also helps slough away dead skin. Like their fruitier counterparts, sugar cane and honey serve as some of nature's key glycolic acid sources. For a simpler, gentler alternative to the pineapple peel, stir 2 tablespoons of pure honey and 2 teaspoons of fresh milk together and apply the mixture to your thoroughly cleaned face. Once it dries, remove the peel with a warm, damp washcloth, another simple exfoliator. In addition to honey's AHA content, it offers antimicrobial and moisturizing properties, while milk contains exfoliating lactic acid and skin-friendly vitamins A and D.
Follow up your homemade glycolic acid peel with an application of your favorite moisturizer, and keep your skin free of pore-clogging makeup and sweat for as long as possible. Avoid excess sunlight for about two days after your peel and apply sunscreen if you venture out; AHA's peeling properties make your skin more sensitive to UV rays. These homemade peels work as a bi-weekly or monthly treatment. Serious acne or recurring hyperpigmentation, however, should be treated by a professional dermatologist.